United in trouble without Pogba v. Man City? The difference between Manchester United being a good side and a very good side this season is Paul Pogba. 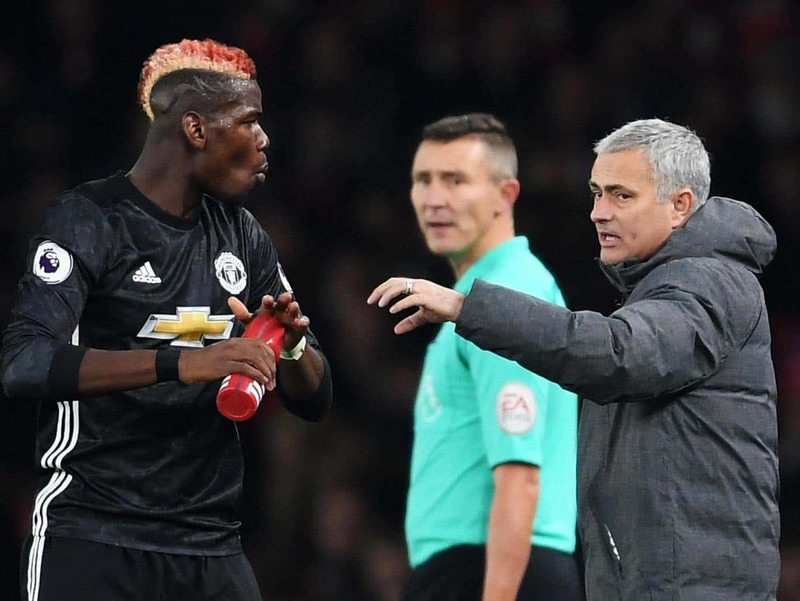 Jose Mourinho‘s men have dropped just two points in the the eight Premier League games Pogba has played this season, scoring 24 goals in the process. Compare that to the seven games he has missed: eight points dropped, just 11 scored. Then consider the three worst performances of United’s season so far – at Anfield, the John Smith’s and Stamford Bridge. All three came during the midfielder’s six-week lay-off with a hamstring injury and all could be described, in a word, as disjointed. When Pogba plays, he provides a link between defence and attack. This is invaluable to Mourinho against fellow top sides as it allows him to play a deep-set defence and take advantage on the counter. The first 73 minutes of the thrilling win at Arsenal this weekend provided a perfect case in point. In the 74th, however, Pogba was sent off for reckless challenge on Hector Bellerin and after United decided against appealing the referee Andre Marriner’s decision, they will now be without him for their most important match of their season to date, Sunday’s derby against Manchester City. With Pep Guardiola’s side eight points clear at the top of the table, how might United overcome the loss of their most important player and reduce that gap to five? As both Marouane Fellaini and Michael Carrick are unlikely to be available for the derby, Ander Herrera is the only senior central midfielder that Mourinho will be able to call upon. Named United’s player of the year last season after number of authoritative performances, Herrera has found things much harder during the current campaign and has failed to make the most out of the minutes he has received. Yet while he lacks Pogba’s technique and vision, Herrera is more capable of providing balance between attack and defence in the middle of the park than Fellaini or Carrick, even if they were available. Among United’s current squad, he is the best alternative and his industriousness will be needed against a City side expected to dominate possession. Mourinho’s approach at Anfield in October was criticised as unambitious in the extreme, but his hopes of snatching three points and a famous victory may have been realised had he deployed his current 3-5-2 formation. Against Liverpool, in a 4-2-3-1 shape, Romelu Lukaku and Henrikh Mkhitaryan were the only two players in predominantly attacking roles and were wholly isolated. Against Arsenal, Lukaku could not end his league scoring drought, but he was more involved alongside a strike partner in Anthony Martial. Speaking after the win at the Emirates, Gary Neville pointed out how if Mourinho retained the 3-5-2 and instructed Lukaku and Martial to play as split strikers, United may be able to exploit the space City’s full-backs often leave while attacking. Another way of building cohesion between attack and defence would be giving more attacking responsibility to the full-backs. Mourinho already seems to place a lot of trust in both Ashley Young and Antonio Valencia when it comes to providing offensive support. Without a driving presence in midfield, their runs down the flanks will only become more important. This would come with obvious risks, though. Neville is right, City tend to pack the middle of the pitch with bodies, but their attacks come predominantly down the flanks. As lone wide players, Young and Valencia would alert and not overcommit themselves against one of the most lethal counter-attacking sides in world football at the moment. All this being said, would any of us be surprised if Mourinho cut his losses, matched City up man-for-man and parked the bus, especially after losing Pogba? In these circumstances, yes we would. This match has been on the United manager’s mind for some time. When City were swatting teams aside by five or six and building up their intimidating lead, Mourinho would talk up the importance of two derby wins and the transformative effect they could have. United will not go all guns blazing – that would be reckless – but settling for a point will not do either. This is their chance to land a sucker punch and swing the momentum in their favour. Even Mourinho would admit it: they must win.